In Buffalo and the rest of the world, it's apparent what the Bills must do this offseason. Spend much time figuring out how to make the offense better while doing little to tamper with the defense, unless it means keeping it together. The Bills defense ranked second in the league last year but they have robbed of the playoffs thanks to a terrible offense. There are four players left on the roster that were there before Brandon Beane and Sean McDermott came to town. Last season, the Bills made the playoffs when they really had no business being there and it showed this season. The Bills defense gave up around 22 points a game this season but that’s because they had to play more than the offense did. That shouldn’t happen in the NFL. Both Beane and McDermott know this. Beane is on the record saying that he knows what needs to happen. It appears that Josh Allen has come to refill the promise other Bills Quarterbacks have failed to do. Beane’s job is surrounding Allen with players who can assist him, which most of his teammates failed to do this season. LeSean McCoy has lost some steam over the years and it showed big time this season. Chris Ivory was solid as a backup while both Marcus Murphy and Keith Ford fulfilled their duties admirably. They might want to bring in one to three options this offseason to see who can blossom and who can take a walk. Speaking of taking walks, the Bills receiving core took a walk this season. Kelvin Benjamin was burnt toast for the Bills, thank god for Robert Foster and Zay Jones. Charles Clay laid an egg this season, he needs to step it up big time. If not, I feel the Bills should look for a trade. Logan Thomas has emerged as a leader in the locker room, keep him and enhance his receiving developments. The biggest problem appears to be with the offensive line, but this whole offense is a problem. Josh Allen is still young, Shady’s getting older, the receivers are young and somewhat inconsistent and the Tight Ends looked more like loose beginnings. Alas, the game is won amongst the front seven. This Bills front seven wasn’t terrible but it wasn’t good, and that’s considered terrible in the NFL. Jordan Mills, Ryan Groy, John Miller and Jeremiah Sirles are set to be Free Agents. The consensus appears to be to let all of them walk, maybe even Mills. The center position was the biggest problem as neither Russell Bodine or Ryan Groy performed well. Richie and Eric were missed big time this season. All I can hope for is that we find two starters who can replace them…it’s a tall task. Another tall task will be replacing Kyle Williams, who’s become a Bills legend. It was nice of us to send him off with a pass in his last game because this franchise didn’t give him much over the years. His defense goes to the playoffs and holds the other team to ten points and they don’t win? Yeezus. He’s going to be missed but I still feel this defense can be beast. Jerry Hughes is entering the final year of his contract so I expect him to be a stud. Shaq Lawson lived up to his namesake big time last year and I feel he could keep rising. Trent Murphy was a pleasant surprise for me as well, I hope his success continues going into 2019. I also hope the Bills can lock at least one of these guys down but I’m not sure about all three. I also hope Beane can lock down Jordan Phillips, who emerged as a likable head in the Bills locker room. If another team offers him more money, he might bounce but that remains to be seen. It also remains to be seen what will happen with Lorenzo Alexander, my guess is a one-year contract. 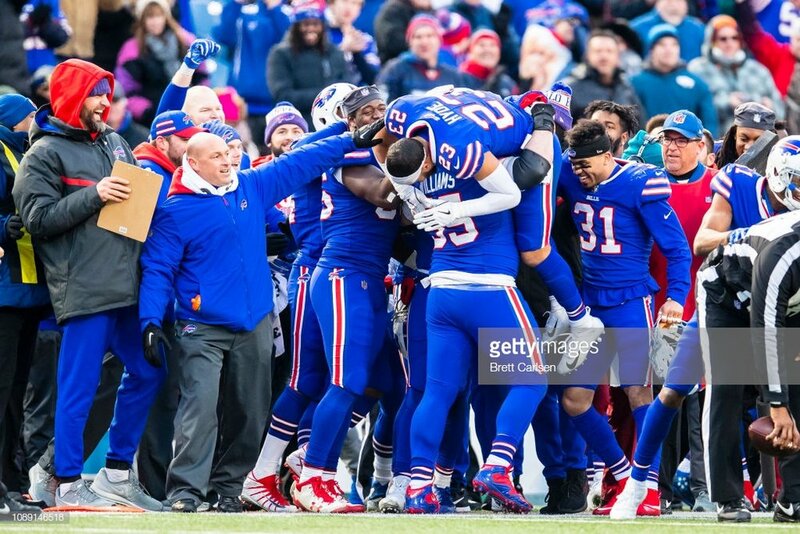 Zo is a great role model for the young Bills linebackers, as both Matt Milano and Tremaine Edmunds had beast seasons for the Bills. They’re the least of my concerns, same with the cornerbacks. Lafayette Pitts is set to walk and I don’t see the Bills reaching out to him. Why would you when you have a guy like Levi Wallace coming back? Where’d that dude come from? Safe is the word to describe the Bills safeties this coming season. They’re not going anywhere. The same cannot be said for one of the Bills punters. Most expect Matt Darr to walk, which leaves the duel between Cory Carter and Corey Bojorquez. That one is a toss-up, which Stephen Hauschka should enjoy watching as no one’s nipping at his heels. The Bills know they need help with the line, tight ends and the running back position. Kyle Williams has left the team but I’m sure someone on that team’s picking up the slack his absence will leave. The line is in need of the biggest upgrade and Charles Clay needs to rebound. There’s a lot of promise I see with this team and with the right moves, there’s no reason why they can’t be successful moving forward. -By: Thomas P. Braun Jr.